British rider Chaz Davies had a lucky escape on the first day of the Malaysian GP in Sepang after he was involved in a tangle with Japan’s Shinya Nakano in this morning’s opening free practice session. TV pictures showed Nakano lying in a heap before limping heavily away from a crash under hard acceleration exiting the second corner. But what the cameras hadn’t picked up was that Konica Minolta Honda rider Nakano had collided with the back of Davies after his D’Antin Ducati broke down exiting Turn 2. Davies said: “My bike cut out coming out of Turn 2 and he hit me from behind. My bike just stopped dead and he obviously had nowhere to go. Making his second appearance for the D’Antin squad as replacement for axed German Alex Hofmann, Davies had a tough first day in the Far East, finishing 17th fastest. Intermittent rain showers did little to help him get the crucial dry track time he needs to adapt to the Ducati’s GP7 machine, but he said plans to increase power tomorrow should help him achieve much faster lap times. He ended up 2.9s adrift of fastest rider Randy de Puniet and said: “The start of the session this afternoon was wet and we went out on wet tyres but it was basically dry. “I was struggling to see where it was wet and where it was dry with the new tarmac because it is so dark. 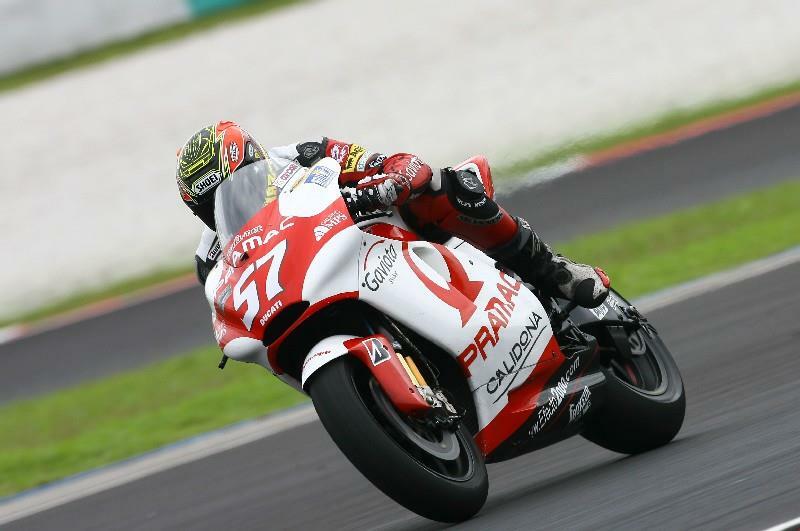 Davies said he picked up some tips on mastering the long and technical Sepang circuit by following team-mate Alex Barros and new MotoGP world champion Casey Stoner, both who ride Ducati machinery. “I have been here before but you have to change so much to adapt to the riding style of the 800. In a couple of places I’m still taking 250 lines. I followed Alex and Casey and on these things, because they have got so much power you can’t take any sweeping lines. "You have to drive them towards the inside of the corner because in the fast stuff you can’t turn the bike if you go out wide. "I have been struggling with that and it feels like I’ve never been here before, “said Davies who was also suffering from a painful back injury picked up during a round of golf with close pal Stoner earlier this week.